So as I am sure you are all aware, bacterial resistance to antibiotics is starting to become a major issue all over the world. This means that some of our old standby drugs, which are some of the main reasons for our increase in life expectancy over the last 100 years, no longer cure diseases that they used to cure. Medical researchers are constantly having to devise newer, stronger treatments, and then the bacteria continue to evolve resistance. You can imagine the frustration of doctors as they try their reliable fallback treatments to no avail....I'd imagine it's not entirely unlike trying to satisfy the ever developing palate of the 2 year old child. Thankfully for the doctors (and for me), there are some things to fall back on that still work (for now). 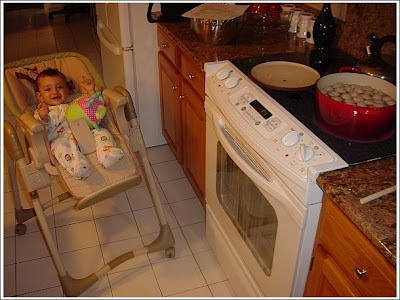 I'm sure this is not unusual at all, but as soon as my daughter rejects whatever new menu item I have cooked up that night, we start going through the list...cheese sandwich, Cheerios and milk, peanut butter and jelly, mac and cheese, and we can usually find something that she'll eat. But lo and behold, some of these items just don't cut it anymore, and any or all of them may be rejected. Panic starts to set in as my wife and I realize we're entering a whole new world where past practice does not necessarily indicate future success. 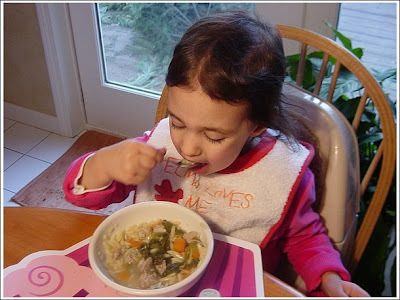 Luckily there's one item that so far has always been a hit, always does the trick, and is devoured within minutes, and that's meatball soup (more specifically Escarole and Orzo Soup with Turkey Meatballs). My daughter even eats the escarole AND asks for seconds. The recipe for this soup is originally from Bon Appetit but I found it featured on one of my favorite food blogs, Smitten Kitchen. Start by beating an egg with a bit of water and soaking the bread crumbs in the egg mixture. Mix the egg/crumb mixture with the parsley, parmesan cheese, salt, garlic, and ground turkey. Mix until just combined. Using wet hands (so the mixture does not stick), form the meatballs. They should be about 1 inch in diameter (or smaller). A small scoop works well here for portioning. If making them 1 inch in size, you should be able to get about 40 meatballs*. Once they are all made, cover them and refrigerate for 30 minutes. Bring the chicken stock to a boil in a large pot (at least 4.5 quarts). Add orzo and chopped carrot, reduce heat and simmer vigorously for 8 minutes. In the meantime, wash, dry, and chop some escarole. Add the meatballs (turn up the heat a bit as the cold meatballs will bring the temperature way down) and simmer for 10 minutes. If you have to walk away from the pot, make sure you have somebody to watch it for you. Add the escarole and simmer for 5 more minutes. Taste the soup and season with salt and pepper to taste. Don't worry, your kids will eat it (until they won't). *I use 1 pound of ground turkey instead of 12 ounces (and I don't use turkey breast meat, but the ground turkey that is a combo of light and dark meat). The seasoning to me is perfect when you make this change, and you get more meatballs! 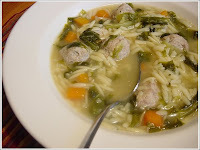 The taste of this soup is excellent as the Parmesan cheese in the meatballs really infuses the soup with flavor, especially if you make it a day in advance. One (potential) downside to making it in advance is that the orzo sops up quite a bit of the broth, and the once brothy soup becomes more stew-like. Now this is not a problem for my family and I because we like the soup this way. If you want your soup flavorful buy still brothy, either thin it out with a little warm stock or water then next day, or don't add the orzo when you make the soup, instead just boil it when you are reheating the soup and add the cooked orzo before serving. I've used dried parsley instead of fresh, and the soup has been just as good. I've made this soup with both homemade and store bought chicken stock, and it's pretty good both ways, most people probably wouldn't even know the difference.